Former president Robert Mugabe’s sons Bellarmine Chatunga and Robert Junior, stepson Russell Goreraza and son-in-law Simba Chikore and leading political figures face imminent arrest after it emerged this week that the country’s anti-corruption commission was investigating an array of offences ranging from illegal gold trade, abuse of office, corruption and murder. This comes as President Emmerson Mnangagwa’s government embarked on a major corruption crackdown, which has already claimed the scalps of former home affairs minister Ignatius Chombo on allegations of corruption, former mines minister Walter Chidhakwa, former agriculture, mechanisation and irrigation development minister Joseph Made on various charges, with arrests of former ministers, permanent secretaries and members of Mugabe’s family looming large. It has also emerged that Mnangagwa has told ministers implicated in high-level corruption to come clean and voluntarily surrender their ill-gotten wealth. “In the next few weeks, you’re going to see some ministers quietly surrendering property, especially buildings, under the guise of donating to communities and empowering the poor. If they (ministers) don’t do that voluntarily, they face the real prospect of being humiliated when crunch time comes. Should they refuse to comply, they will be investigated and prosecuted,” a well-placed source said. Sources confirmed that one particularly wealthy minister has been told to comply with the directive or face a formal probe. “This is a serious matter. He was told that he is tarnishing the image of the new government because everyone keeps citing his corrupt dealings and how he acquired a vast business empire under controversial circumstances. Even some former ministers are approaching the new government to open talks on how they can take action towards surrendering some of their property,” another source said. According to sources close to the developments, the Zimbabwe Anti-Corruption Commission (Zacc) is probing with the intention to arrest Chatunga, Robert Jr, Chikore and Goreraza, former energy minister Samuel Undenge, former tourism minister Walter Mzembi, Highfield West legislator Psychology Maziwisa, television personality Oscar Pambuka, and an Ambrose Made. Chikore, a former Air Zimbabwe chief operating officer, is being investigated for a number of transactions he did during his tenure at the national airline and is also facing allegations of illegal gold trading. 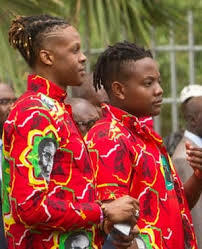 Mugabe’s sons, Chatunga, Robert Jr and Goreraza are under investigation on illegal gold trading allegations. Zacc has also received requests from two families to investigate Goreraza, whom they implicated in an attempted murder shooting and the killing of a miner in Kadoma. The murder allegations emanate from a shooting of an employee at Tolrose gold mine in Kadoma when he allegedly invaded it. In October 2013, Goreraza allegedly stormed the mine at Eiffel Flats in the gold-mining town armed with letters showing that he had taken over the company whose ownership was already at the centre of a dispute between businessmen Jameson Rushwaya and Patterson Timba. He claimed he bought the shares from Timba and as a result Rushwaya was kicked out of the mine at gunpoint. Robert Jr and Chatunga led a lavish lifestyle when the majority of Zimbabweans struggled to make ends meet. Mzembi is also facing corruption charges and is under investigation for allegedly abusing state funds and cars bought for the hosting of the United Nations World Tourism Organisation general assembly co-hosted by Zimbabwe and Zambia in 2013. Mzembi is also accused of inflating prices of LED television units meant for the World Cup in 2010, which were valued at US$2 million, according to his ministry. In April 2010, Mzembi’s ministry made arrangements to purchase 40 LED TV units from a company in China as part of preparations for the World Cup hosted by South Africa, but the sets were only delivered 13 weeks after the event. In her 2010 audit report, Auditor-General Mildred Chiri said an investigation should be carried out to establish whether tender procedures were followed or not and why the Ministry of Tourism allowed the delivery of the equipment worth US$2 million 13 weeks after the World Cup. In 2015, without explaining why the TV units were delivered late, Mzembi dismissed Chiri’s report as a “petty issue”, saying the televisions could be accounted for, but have since been “donated” countrywide. Former Sports minister Makhosini Hlongwane and former Labour minister Patrick Zhuwawo face corruption charges for allegedly abusing the youth fund. Zhuwawo is currently out of the country and has vowed not to return to Zimbabwe because his safety is not guaranteed. “A letter dated February 11 2016 written to government by Mbada Diamonds states that Ministry of Mines officials and hundreds of fully armed police descended on Mbada Diamonds to ostensibly implement a new government policy. They forcibly drove out employees including security personnel and they disabled all security equipment including CCTV and they broke into the vault area and stole a gem diamond box with stones worth millions of dollars,” a government source told the Independent. Sources say additional charges will also be preferred against Chombo. “What Chombo has been charged with so far is only 10% of what he is going to be charged with,” a source said. “More charges are also going to be pressed against former Zanu PF youth chairperson Kudzanai Chipanga who is out on bail. Zacc is also targeting Ambrose Made, who faces abuse of office charges. He was chairperson of Minerals Marketing Corporation of Zimbabwe (MMCZ) and Mining Promotion Company, which was formed without approval of the Ministry of Finance. Former NetOne chief executive officer Reward Kangai also faces arrest on corruption charges emanating from an audit report titled Provision of Comprehensive Forensic Investigation Services to NetOne Cellular Services compiled by PriceWaterhouseCoopers on behalf of the Auditor-General. According to the audit report released in 2016, NetOne, under Kangai, allegedly made shady payments totalling US$32 million to 10 contractors without documentation. Undenge also faces arrest on corruption charges. He is accused of ordering Zesa Holdings to hire Fruitful Communications, a firm linked to Zanu PF Highfield West MP Psychology Maziwisa and Zimbabwe Broadcasting Services presenter Oscar Pambuka, to carry out a media campaign despite the fact that Zesa has its own public relations department for that specific purpose. Fruitful Communications charged the ZPC US$36 000 for public relations work done. However, the ZPC refused to pay. Undenge had previously told the media that Fruitful Communications offered its services to Zesa for free. When contacted for comment, Maziwisa terminated the call after being asked about the investigation and stopped answering the phone. Pambuka’s number was continuously on voicemail. Undenge’s mobile phone also went unanswered, while Mzembi and Hlongwane’s were not reachable.